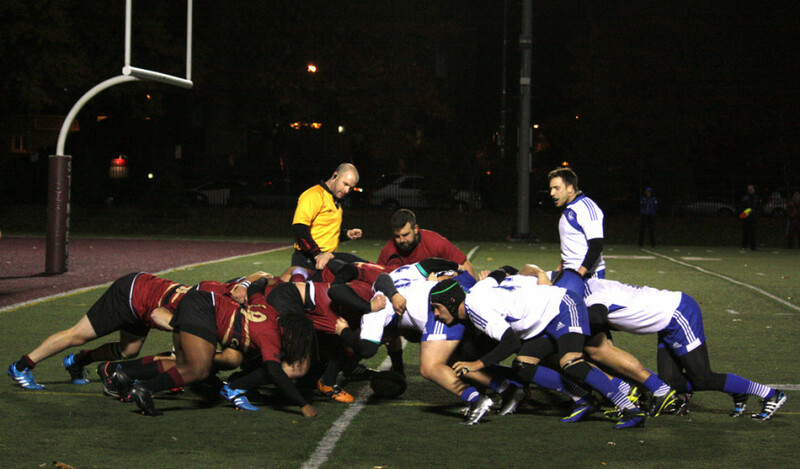 It was a cold Friday night for Stingers fans at the men’s rugby team’s final regular season game. While the weather may not have been ideal, those who braved the cold with gloves, blankets and tuques were rewarded in the end. The Stingers knocked off the Université de Montréal Carabins on Friday evening 26-15 at Concordia Stadium. Combined with McGill’s 15-13 loss at Bishop’s that night, the Stingers win secured them first place overall in the Réseau du sport étudiant du Québec. “It was really cold, especially for me out in the wing, but you don’t really think about it out in the game,” said winger Fred Kacou, who scored a try in the game. The Maroon and Gold held strong for a good part of the first half. Even when tested deep inside their own zone, they gave up few opportunities for the Carabins to score. Offensively, the Stingers scored 19 points in the first half, with tries from Kacou and forwards Lucas Hotton and Erik Samuel. However, the end of the first half saw a small crack in the Stingers defence. Montreal gained ground with a penalty conversion and a try in the last three minutes. At halftime, the scoreboard read 19-10 for Concordia. 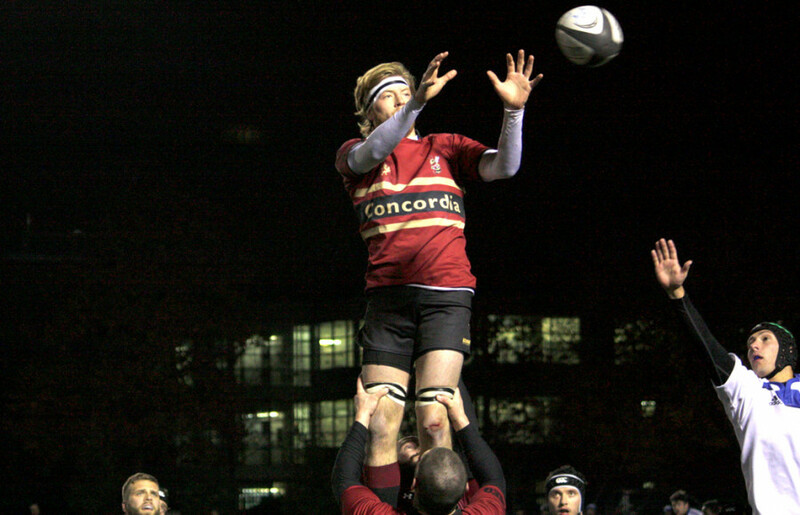 Concordia followed through with a strong second half, with an early try from veteran back Caleb Jordan giving the Stingers a 16-point gap. The Carabins trimmed down the score to 26-15 with a try, but it was too late for them to come back in the game. Stingers head coach Clive Gibson was content with his team’s efforts, but noted there’s always room for improvement. “I’m proud of them but there are two or three problems we need remedy before next week’s game,” said Gibson. Having fought hard for first seed in their division, the Stingers can enter the postseason on a positive note. The top-seeded Stingers will once again host the Carabins, who are the fourth-seeded team, in the provincial semifinals at Concordia Stadium. While there was celebration following the win on Friday night, the Stingers are already focused on their semifinal matchup. On the players’ side, confidence is present. They’re keeping their eyes on the overall objective, the championship. “We’ve played [Montreal] twice already so we’re going to study film to see what we missed and I’m sure we’re going to be ready for next week,” added Fulginiti. The Stingers’ semifinal game against UdeM will be on Sunday, Nov. 16 at 1 p.m. at Concordia Stadium.